Hi friends!! Today, I am sharing this card with you that I created using the Honey Bee Stamps Bushel and a Peck stamp set! I adore this set! I don't know what it is about baskets, and apples, but it just seems so classic and a representation of fall to me. And, I love how these images are big enough to hold their on for a focal point on a card! 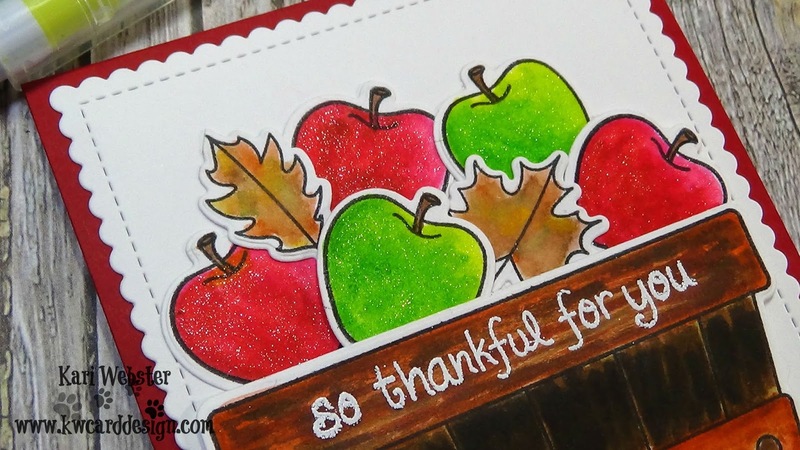 I also wanted to do a combination of red and green apples. The green really adds a nice pop of color, since the basket has a lot of warm tones to it. Once I was happy with the coloring, I used the coordinating dies to cut out all the images, and I strategically placed my images, and added them either using liquid glue, or giving them a bit of dimension with foam tape. As you can see, I used my beloved Blue Prints 27 dies from MFT to place all my images onto. 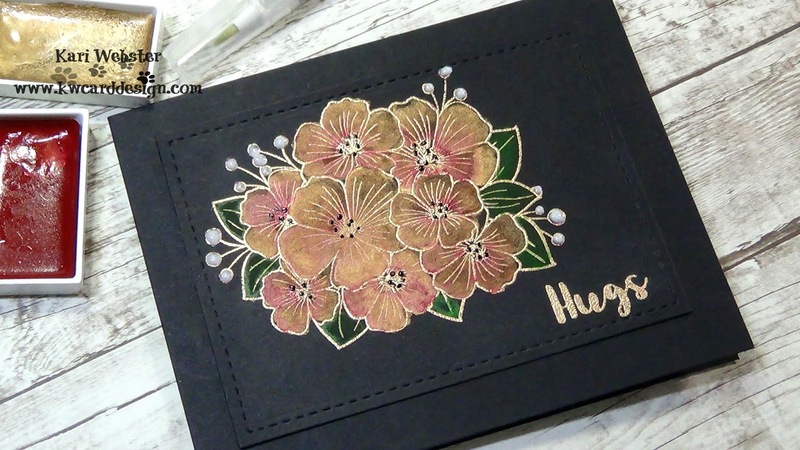 It is the perfect combination of scallop and stitching to this card panel! 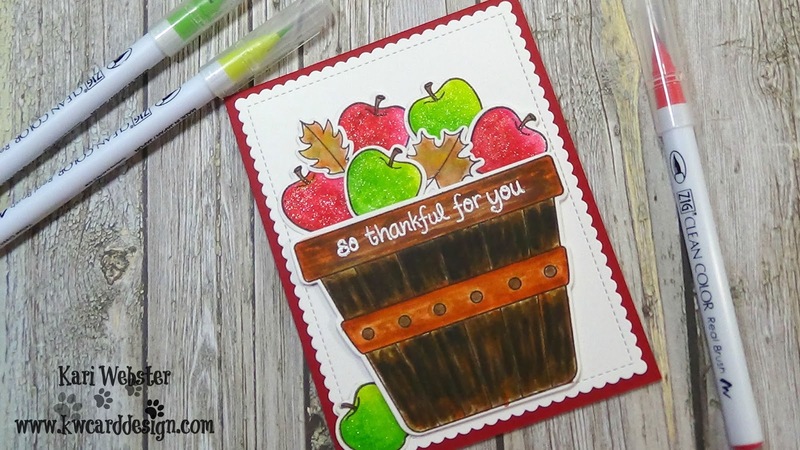 To finish up my card I added my sentiment which comes from an older Lawn Fawn set So Thankful, and added my main panel to an A2 sized card base with is School House Red from Simon Says Stamp. I also added some shimmer with my clear wink of stella pen. Thank you for taking the time out of your day to visit me! I will be back soon with another project! Hi friends! 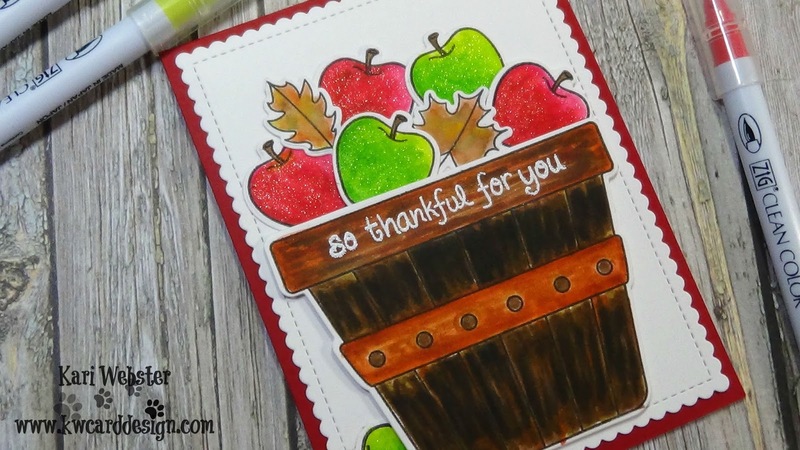 Today I am sharing this card with you that was a complete experiment on my part! I wanted to create a floral card, but I wanted to do it on dark card stock, and I wanted to the flowers to really pop. 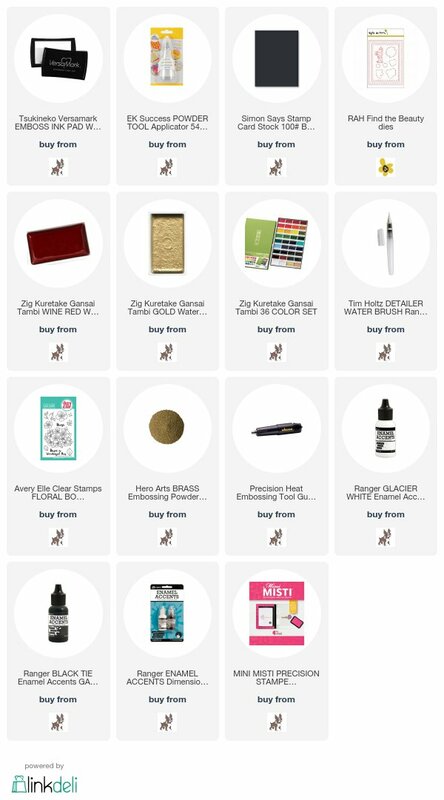 So, I knew I had my Gansai Tambi watercolors and also knowing that these are the more pigmented watercolor I own. I started out by die cutting a piece black card stock from SSS and the Right at Home stitched rectangle die. I put my black piece into my MISTI and prepped my black card stock piece with my anti static powder tool, and then inked up my stamp with VersaMark ink. I then coated the image with Hero Arts Brass Embossing Powder. This is one of my favorite metallic powders I own. I heat set the powder with my heat tool, and then just rubbed my hands to get rid of any residual powder left behind. I also heat embossed my sentiment at the same time. 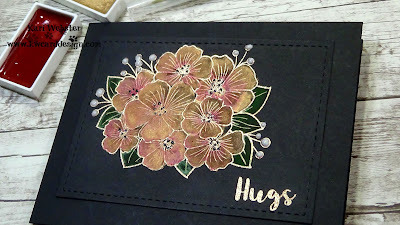 I chose two colors from my Gansai Tambi water color palette, and got to work on my Rose Gold inspired flowers. I knew that the overall look was going to be metallic, but I wanted to have the look of the red/pink in it too to create the look of a rosy gold. It took a few layers to achieve the look I wanted, but in the end, it turned out the way I hoped. I also added some green to the leaves as well. Once the piece was completely dry, I added back in some final accents to the flowers with my black enamel accents from Ranger, and also the white to the buds around the flowers. I really think this helped the overall look of the flowers. All there was left to do was add this to a black card base, and the card is complete. I also have a video tutorial if you'd like to check it out!! All the supplies used are listed/linked below :) Have a great rest of your weekend!